Imagine you have been planning a road trip for weeks, maybe even months. You have researched the best route to take, the most relaxing places to stop over, and all the sights you want to see. It’s the day of departure. The bags are packed. The fuel tank is full. The hotel is booked. And the baby is… screaming?? This wasn’t the way you envisioned your road trip to start out! But let’s face it: travelling with a baby isn’t always going to be easy. Actually make that life. Life with a baby is never completely smooth sailing. I’ve been on many trips with our three kids and, at one point or another, it seemed things couldn’t get worse. Some people thought we were absolutely insane to start road tripping around Australia before our daughter even turned one. But kids never cease to surprise me and, most of the time, I have been so incredibly grateful that we put in the effort to travel when the kids are young. They get to experience so much and so do we. After all, happiness is not waiting for the storm to be over, it’s learning to dance in the rain. It is pretty much inevitable that at some point on a road trip your baby will throw a spanner in the works by having a nappy explosion, suddenly waking up with a fever, or taking an extra long nap (or no nap at all). Wouldn’t it be the same sort of thing, however, if you just stayed at home? Babies might make travel a bit more complicated but that is no reason to wait until they are older to get out and about. Take it from me: older kids bring their own complications as well. Challenges with babies will happen no matter where you are. It’s great for everyone to get out of the regular routine and explore somewhere new so don’t put your dreams of hitting the road off until later. Even if your first destination is only a couple hours away, why not give it a try? 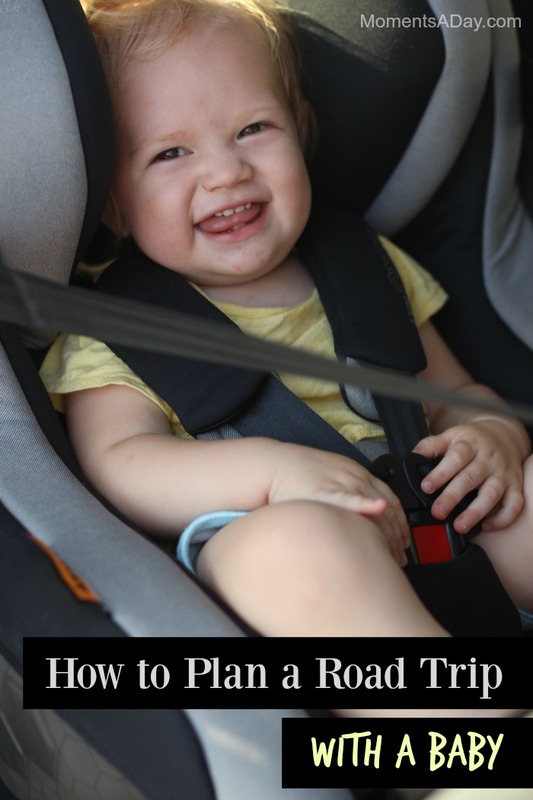 Here are a few tips that will make road tripping with a baby a little bit easier for you. I hope they will inspire you to plan a trip soon! This post is brought to you by Nuffnang and Maxi-Cosi. The worst thing about traveling is feeling anxious about safety. When we left for our Year of Travel, many people warned us about kangaroos suddenly jumping into the long roads in the Outback which made me really nervous about accidents! Luckily our bub is being transported around the country in a carseat from Maxi-Cosi Australia which really gives me peace of mind. As Europe’s most popular and trusted car seat brand, Maxi-Cosi is constantly seeking out the latest and most advanced carseat safety innovations from around the world and tailoring them to comply with Australian standards. I definitely put choosing the safest carseat as the number one thing to do before you travel (or get into a car at all) with a baby. The seat we have is the Maxi-Cosi Euro NXT which is a convertible car seat suitable for newborns to approximately four years. I love that it lasts for so long. 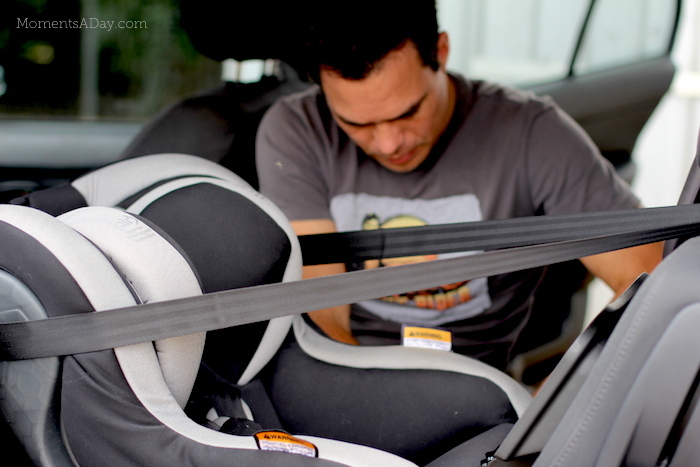 A big safety bonus is that it allows baby to sit for up to 30 months rearward facing! The Maxi-Cosi Euro NXT uses the ISOFIX compatible soft latch system which makes installation super easy (if you watch the instructional video online first, it will take only a few minutes). When my hubby was installing the carseat, he commented how much cushioning it has. Baby definitely wins the comfiest seat in the car award! Side impact protection: The Air Protect cushions (pictured above) utilise Maxi-Cosi’s innovative air protect technology through a controlled release of air. These cushions reduce crash forces around your child’s head should you have a side impact collision. GCELL™ technology: You know how a bumper reduces crash forces for your car? That’s how I understand GCELL™ technology to work. There’s something called high performance thermoplastic elastomer (TPE) that lines the entire outside of the car seat shell and acts as a crumple zone to make baby safer in the seat. Wicking fabric: The “Cool Baby” fabric keeps babies cool which is especially important during summer trips when heat can be a test for anyone. 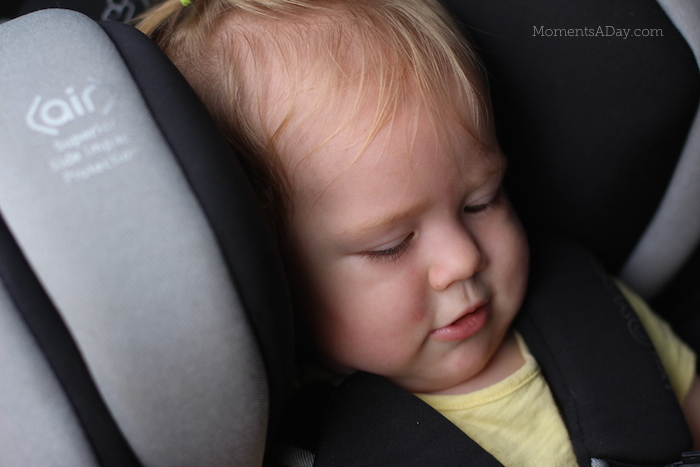 Comfort is key to baby having a good trip and this extra feature has already been much appreciated by our daughter travelling through the Queensland summer! Speaking of temperature, it is important to set a comfortable temperature for everyone in the car, remembering that the back of the car usually gets hotter than the front if you have an old car like us with more air conditioner vents in the front. Passengers in the back may wish to wear lighter clothing (or those in the front can bring an extra layer). In cooler months it can be nice to pack a small blanket. After the all-important safety box is ticked, it is time to start thinking about what to do during the drive. Travel is easiest when baby sleeps most of the time. We always plan driving around nap time. We do our best to get everything ready to go about 20 minutes before baby normally gets tired so that we can play in the car for a few minutes and then she can start to relax before she gets sleepy. Playing soft music or audio stories helps the other kids stay quiet during her nap. If your bub is sensitive to noise, you may like to get any older siblings a set of headphones. I like to keep a well-stocked bag of items for baby to explore. These don’t have to be only toys. Plastic measuring cups or spoons, balls, rattles, blocks, plastic animals, it just depends on your baby’s age and development – as long as there are no small parts that baby might choke on, of course! Having quite a few novel items for baby to look at and then throw on the ground whenever she’s done definitely passes some time. 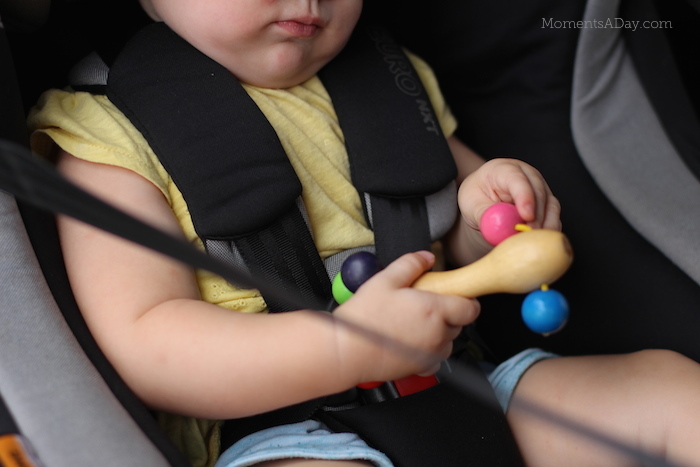 We don’t have a lot of electronic gadgets for our kids but giving baby a few musical toys with buttons has proven to be a winner on road trips. 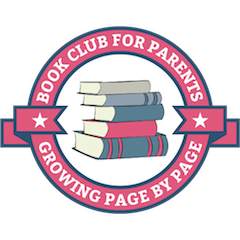 Touch-and-feel or lift-the-flap books are also great. Don’t be afraid to sit in the backseat to help your baby enjoy the ride as well. Snacks are another way to keep everyone happy on a car trip… and don’t forget the grown-ups either. Prepare everything in snack sized portions so you can just hand them out when travellers get peckish. 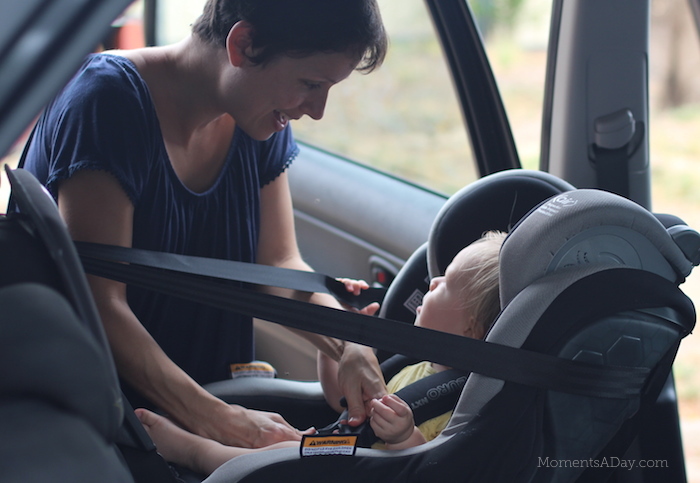 Depending on the age of your baby, it is best to stop the car to eat so that there is no risk of choking. Fruits that stay fresh (and are not too messy) like strawberries, grapes (cut into four pieces for babies) and pre-peeled mandarins are some of our family favourites. Cruskits, mini sandwiches and muffins are good too. If you have an older baby, packaged foods can be very handy for travel. I always like to keep a few jars of baby food in case bub gets hungry before we are able to stop and have a meal or if she doesn’t like the food at our destination. Don’t forget to pack your water bottles too! If I am sitting in the front seat, a travel mirror which lets me see baby when she’s playing or eating also gives me peace of mind. It is good to pack an extra change of clothes (or two) in your nappy bag as baby may get wet or dirty on the drive or pit stops. Those leaky nappies always seem to happen when you are out and about, don’t they? You don’t want to be digging through luggage to find what you need on the side of the road. You will also want to put together some emergency medical supplies like baby fever reducer, constipation meds, and pain relievers (for yourself too) just in case. For the trip itself, set realistic expectations for how far you can get with everyone’s sanity still in tact. My husband and I take the conservative route when deciding how many hours we will drive in a day. We normally try to cap our daily drives to four hours max. This is because we ourselves don’t want to get tired of driving and we want the family to be able to enjoy time at each of our destinations, as well. Therefore we like to plan nightly stopovers if our trip exceeds 4 hours to our final destination. If things are not going to plan, don’t be afraid to stop if bub needs a little break. Getting out of the car for a few minutes to stretch and have a look around may be all that is needed for another half hour of peaceful driving. We often like to do one or two hours at a time to break up the drives but have been known to stop after 15 minutes if it’s really needed. Remember that your mood can rub off on everyone in the car, so try not to be too anxious! Directions, inclement weather, and kids asking “Are we there yet?” can create stress. Embrace the chaos! Playing some favourite music or stopping for a meal can help reset the mood if things get tense. To make things easy on yourself when you finally get to your destination, put together a bag of items you will need soon after you arrive. For us this usually includes pyjamas, toothbrushes, any sleep-time toys, and a few extra snacks. If you have a few one day stops before your final destination, pack what you will need so you can leave the bulk of the luggage in the car ready for the next day. This giveaway has officially ended as of 29 March 2016. Thanks for your interest. What is your dream road trip and why? I received a Maxi-Cosi Euro NXT to review for this post. All opinions are my own. To read more about sponsorship on my website, visit this page. My dream road trip isn’t really about a destination but the journey itself. The packing and excitement leading up to the travel, the early morning departure and the breakfast on the road. Finding playgrounds and parks to stop and and drink a cup of tea. Even toilet stops at the petrol station. They all add up to fond memories from my own childhood road trips from Yeppoon to Brisbane. I have great memories of story telling, playing eye spy, reading and snoozing. So for me it isn’t the destination. It’s the memories. But if you twisted my arm to name a place I’d say Germany. I’d always say Germany. Love hearing about your memories, Miranda! I would love to roadtrip around New Zealand, bringing our car seat over on the plane first of course! Great Ocean Road! Stopping for a swim and photos of course! The photos of the Great Ocean Road are always so beautiful! My dream road trip would be Packing up the family and travelling around Australia for a year with no schedule. Australia is such an amazing country, so much variety and so many interesting things to see! To travel through country Ireland with our 2 children, getting off the beaten path and enjoying the gorgeous scenery at our own pace. We are not tied to Ireland in any way but both of us think it would be the ideal place to take our family to visit some of the most beautiful and untouched land. Oh Ireland sounds lovely! I remember seeing a few documentaries, looked incredible. I can’t help but think about the music and dancing too! One side of my family lives in Sydney. As a child I have very fond memories of making the 12hr journey there to see them (we did it all in one go). My parents would put us in the car early in the morning while it was still dark and we would wake up already well on our way. We would pack a gigantic container of white bread and ham sandwiches to keep us fed on the way. Despite making this journey when we were quite young and only stopping for necessary toilet breaks I don’t ever remember being bored or grumpy in the car which is a bit of a miracle really haha. It may have been because we were so excited about the end destination and who we would see when we got there. As an adult I’ve made the same journey with my own children and being the one to get up in the dark and drive the whole way does make it a little less exciting than I remember but still great. Car seat safety was obviously not something I had to worry about as a child but is definitely the number one priority for road trips these days. You can never be too safe with your little ones. Love that, Kristy! Snacks definitely help make the road trip more fun 🙂 Funny what we associate with childhood memories! It would be to pack up the kids and road trip around the USA in a camper van. I wouldn’t have a set schedule and just go where the roads take us. Total care free road trip! Lovely!! I haven’t been around much of the USA outside of the Eastern/Southern states myself, would love to go as well! As a kid I was lucky enough to road trip through Central Australia. Memories of the sights may have faded but I’ll never forget the experiences – camping in the red dirt, visiting the communities, listening to Aboriginals share dream time stories. And, oh, swimming in the waterholes! Hubby and I are determined to go back to basics and relive those road trip experiences with our boys. (Hopefully the boys will polish a few of their gems along the way too!) The only thing we’re not willing to compromise on though is car safety, especially with baby no. 3 on the way. I don’t think our road trip would be complete without a Maxi Cost Euro NXT for bub – and some late 80s/early 90s Australian rock! Sounds awesome 🙂 We are visiting Alice Springs in July, I hope my kids make some of the same memories! And music in the car is definitely key! My dream road trip would be to travel with our family all the way to Central Australia! I was born in Alice Springs but left when I was a toddler so have no memories of it! Would be so fun to explore that amazing part of our country together, and see places I have only seen myself in photos as a bub. To get that outback experience together would be so magical! We have always dreamed of road tripping from the east to the west coasts of America. We were all booked to go a few years back with my Dad, step mum and siblings’ families when we had a tragedy in the family and had to cancel. I still think about it often but it never seems to be the ‘right’ time. Maybe one day we’ll get there! Ohh so sorry to hear that! I had an international trip cancelled once due to tragedy, it isn’t easy – but surely there must be a wisdom and hopefully the “right” time will come soon! Looks like a great car seat. I remember searching for hours online trying to find the one with the best safety rating and positive reviews when I was looking to buy them, it can make such a difference in an accident. My dream road trip is around Australia in a motor home. There are so many different features to carseats these days, aren’t there?! We love this one so far, has ticked all the boxes. Australia is definitely an amazing country! My dream road trip isn’t just about the destination but the cargo too – and my wife, kids and I will be embarking on it later this year when the newest addition to our family arrives. We’re planning on visiting family in a couple of states to show off our new baby and for a good old catch up. The road trip should be fun with 3 kids in the back, right Chelsea?! I’ll be sure to be using a few of your tips and tricks! I’d love to drive our kids all the way up the east coast to Darwin…imagine how many cool things we’d see on the way! I reckon driving with a baby is the best… it makes you slow down and not rush from one place to the next! You are a brave lady! My littlest is not good in the car, like super not good, so my dream car drive is just that -a dream! I am a single mom of a 16 month old and i try to speak life into him. His bio father is NOT in the picture and I NEVER ever want him to feel like it was his fault or unloved or whatever the enemy would try to bring up. Thank you for this list. It’s awesome!